Established in 2002, Virtual City casino has a massive experience and a long-standing reputation in the market that it boasts of. The Casino is owned by Technology Services Trading Ltd, that offers players a vast selection of thrilling games that are hard to resist. Being in business for over ten years, Virtual City Casino has secured its spot in the diverse online gambling market with its massive years of experience. The Casino offers its players an amazing selection of thrilling games, has a robust 128-Bit SSL security protocol, a 24/7 customer support team offering quality services. 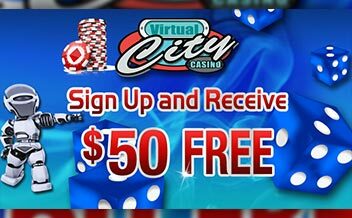 On signing up at Virtual City Casino, you receive 5 amazing welcome bonuses as a head start to your gameplay in the best way. 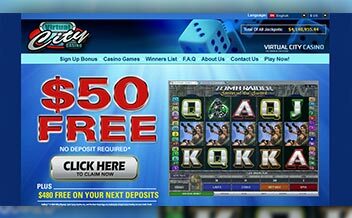 For the first 5 deposits, you stand to receive up to $530 to play on over 550 games of your choice. Additionally, one can get another $40 if you make a deposit of $100. Players can also get casino rewards as part of the loyalty program. Furthermore, you can earn up to $1,000 through the referral buddy system. Virtual City Casino offers a total of 15 progressive jackpot games for anyone who is looking to smash it and win big awards. Games included in the progressive section of Casino include; Adventures in Wonderland, A Night with Cleo, Beach Life, Bay Patrol and many others. Slot lovers have a lot to enjoy at the Microgaming casino. The casino houses one of the largest selections of slot games around. 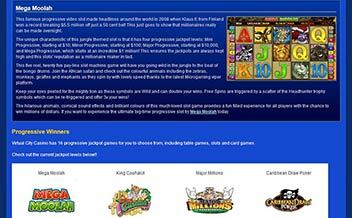 Their most popular section, the video slots, contains games that are both graphically advanced and bonus-filled. Players can also enjoy three-reel slots and AWP games from the same menu. If table games are more of your thing, you will have more than you probably even need at Virtual City Casino. In addition to several variants of roulette and blackjack, you can play baccarat, red dog, various table pokers, and other specialty games. With professionally done animations and generous rules, they’re worth the time. If video poker is your game of choice, there’s a lot of different varieties to check out at Virtual City Casino. Players can pick from three denominations: single-hand, multi-hand Power Poker, and multiplier-based Level Up Poker. Each of these denominations comes with a number of different variants, some of which you may not have seen before. 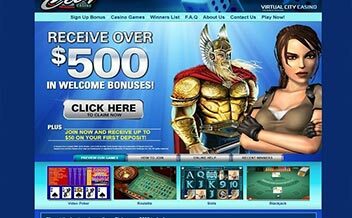 Virtual City casino uses the Microgaming software for both their download and instant play thereby offering a variety of thrilling games that are tailored to meet the diverse needs of the gamers. Belgium, France, Hong Kong, China, Israel, Turkey, U.S. Minor Outlying Islands, U.S. Miscellaneous Pacific Islands, U.S. Virgin Islands, United States, and many others.  Bank Transfer, ClickandBuy, eCheck, EcoPayz, EntroPay, InstaDebit, Kalibra, Maestro, MasterCard, Neteller, PayPal, Postepay, Skrill, Visa, Visa Debit, Visa Electron. US dollars, Canadian dollars, Euros, British pounds sterling. Virtual City Casino is supported by major browsers such as Mozilla and Chrome. The software is available in instant play and downloadable to PC. Has a 24/7 support via live chat. The Casino’s sci-fi theme serves as the gateway to a large collection of Microgaming-powered games. As part of the Casino Rewards group of casinos, Virtual City Casino also boasts a long-standing reputation which goes a long way in doing more good than harm. The Casino has a 24/7 customer support that includes a live chat bubble, emails, and a toll-free phone service. The customer support agents are committed to resolving players’ complaints which is a plus in online gambling.